Sulphuric acid is a highly corrosive strong mineral acid with the molecular formula H2SO4. Sulphuric acid is a diprotic acid. Sulphuric acid has a wide range of applications. It is also a central substance in the chemical industry. Sulphuric acid, H2SO4 is manufactured in industry through Contact Process. The Contact process consists of four stages. The gas produced is then purified and cooled. Sulphur dioxide can also be produced by burning metal sulphide such as lead(II) sulphide or zinc sulphide in dry air. In a converter, sulphur dioxide and excess oxygen are passed through vanadium(V) oxide. vanadium(V) oxide act as catalyst to expedite the process. About 99.5% of the sulphur dioxide, SO2 is converted into sulphur trioxide, SO3 through this reversible reaction. Sulphur trioxide is dissolved in concentrated sulphuric acid to form oleum （H2S2O7）. The oleum, H2S2O7 is then diluted with water to produce concentrated sulphuric acid, H2SO4 in large quantities. The two reactions in the third and fourth stages are equivalent to adding sulphur trioxide, SO3 directly to water. However, this is not done in industry because sulphur trioxide, SO3 reacts too violently with water. This produces a lot of heat and a large cloud of sulphuric acid, H2SO4 mist. The mist is corrosive, pollutes the air and is difficult to condense. Sulphur dioxide, SO2 is one of the by-products of the Contact Process. It is one of the sources of environmental pollution. Sulphur dioxide (SO2) is the pollutant primarily associated with acid rain. Acid rain occurs when pH of the rain is between 2.4 and 5.0. This is due to the reaction of sulphur dioxide, SO2 with rainwater. corrosion of concrete building and metal structure. causes erosion of top soil. SO2 is an irritant when it is inhaled and at high concentrations may cause severe problems in asthmatics such as narrowing of the airways, known as bronchoconstriction. Asthmatics are considerably more sensitive to the effects of SO2 than other individuals. The principal source of SO2 is from the combustion of fossil fuels in domestic premises and, more importantly, non-nuclear power stations. 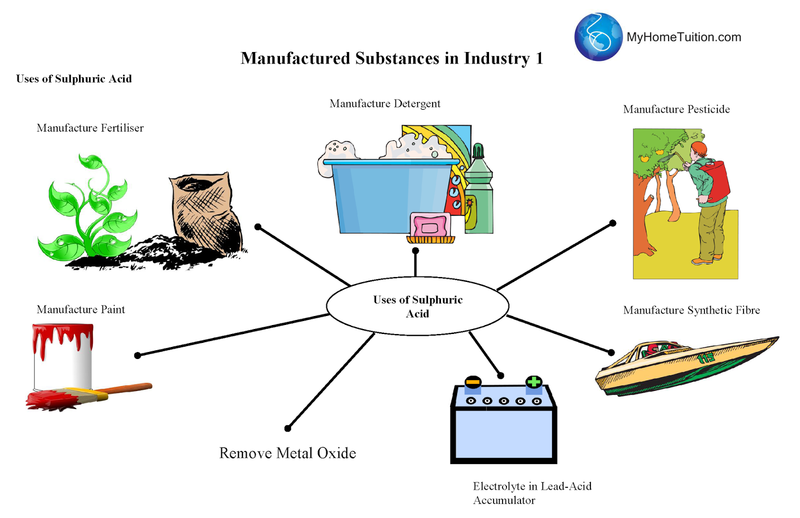 Other industrial processes such as manufacturing of sulphuric acid also contribute to the presence of SO2 in the air.